[Guy] Gambill, an Army vet whose younger brother recently wrapped up two tours in Iraq, wants Minnesota to adopt a law passed in California last year that provides alternative sentencing other than jail for first-time, nonviolent offenders who are combat veterans. The offender, according to California's bill, must convince the court that the crime - drugs, burglary or other offenses - was tied to combat stress, post-traumatic stress disorder or some other related condition. The diversion would more than likely involve court-directed counseling or treatment. "This is not a 'coddling of criminals,'" Gambill, who is advocacy coordinator for the Minnesota Council on Crime and Justice, said before the meeting kicked off at the Department of Veteran Affairs in downtown St. Paul. "This is an effort to raise public recognition of the fact that, all too often, some of our combat veterans issue a call for help and that call sometimes comes from a jail cell or the back of a squad car." It's a concern many folks who attended the meeting share and are working to address, particularly as Minnesota prepares to welcome back 2,600 combat troops this summer. Gambill, who recently served on Gov. Tim Pawlenty's "Beyond the Yellow Ribbon'' task force, says he receives from two to 10 calls weekly from either returning vets who have run afoul of the law or their relatives. As a combat stress officer covering six states, U.S. Army Reserve Maj. Cynthia Rasmussen deals daily with similar calls, as well as many others covering a range of re-integration problems. At the meeting, for example, she noted the number of soldiers receiving divorce papers or other bad news while serving in combat zones. "These are warriors coming home to a civilian world," Rasmussen told a gathering that included fellow soldiers, government officials, legislators, judges, attorneys, social service and nonprofit workers. "Those skills don't work when you are back home driving to work, going to the mall, paying the rent. Something goes wrong, and it creates a spinning ball that keeps on spinning." The Seventh Judicial District, which covers St. Cloud and Moorhead among other cities, will begin collecting data July 1 on any criminal or family court case involving a veteran involved in active combat deployment within the past five years. The court system in Hennepin County also has expressed an interest in following suit. "We want numbers," said Minnesota Court of Appeals Judge Renee Worke. "We cannot construct a court system or a response around a perceived problem. We need to determine where there might be trends." Other broader re-integration efforts under way include a "Warrior to Citizen" program launched by the University of Minnesota Humphrey Institute for Public Affairs' Minnesotans Working Together campaign. The statewide coalition's main objective is to reach out to and tap the skills of returning vets. Exposure to a severely traumatic event can cause nightmares, flashbacks and difficulty sleeping. For most people, these post-traumatic symptoms disappear over time. 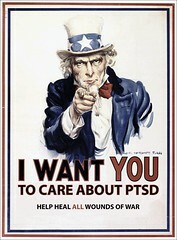 For others, the symptoms become chronic and lead to PTSD. More audio discussions on PTSD. According to the Pentagon's own mental health taskforce, US troops have been undertaking higher levels of sustained combat duty than that experienced by soldiers during the war in Vietnam and in the second world war. It found that 38% of soldiers, 31% of marines, 49% of national guard members and 43% of marine reservists showed symptoms of post-traumatic stress disorder or other psychological problems within three months of returning from active duty. Its report also noted inadequate mental healthcare and facilities, and prejudice over mental health problems. The US has about 155,000 troops in Iraq, most of whom typically spend 15 months in combat zones with a guaranteed 12 months at home. But that is a breach of the Pentagon's own rules saying equal time should be spent on and off duty. This week, Peter Geren, acting army secretary, told Congress that extended stints of frontline duty could be ordered if President Bush opted to push the 30,000-strong troop surge in Iraq beyond September. The senate armed services committee heard that while no decisions had been made, plans had to be started. An Armywide education program on post-traumatic stress disorder and traumatic brain injury will be pushed out next month to every leader and soldier in an effort to remove the stigma associated with asking for help with the stress of war. “We’re all worried about it. We’ve got to get rid of the stigma and that’s what this education program is supposed to do,” Army Vice Chief of Staff Gen. Richard Cody said Friday in a press briefing on progress in improving care for soldiers returning from the war zones. The surveys of soldiers conducted in the war zone and on redeployment “are not as good as chain teaching,” he said, referring to educating all troops through leaders at every level. “I don’t want percentages, I want to know names and I want to take care of these people. We’re going to chain teach this in the entire Army,” Cody said. ...[A]ccording to a draft study on disabled veterans' incomes prepared for the Veterans Disability Benefits Commission, ...[t]he typical veteran is awarded disability pay at about age 55. The present value of their diminished lifetime earnings is about $150,000 and over their remaining years they will draw about $145,000 in VA disability compensation, nearly matching average earning loss. But the fairness of disability payments unravels when actual earning losses are broken out by the veteran's age when payments start, the severity of disability and whether conditions are physical or mental. Earnings capacity is affected far more dramatically by mental disorders, CNA found. CNA noted that a 25-year-old veteran who returned from war 100-percent disabled from physical wounds and was rated as unemployable by the VA, began receiving $28,352 a year in disability compensation, using 2005 rates. That amount was more than $11,000 short of the $39,447 needed annually to stay even with nondisabled peers, the study found. VA paid the same $28,352 to a 65-year-old veteran rated as "IU" or individual unemployable. But if that older veteran became disabled for the first time at 65 based on latent service-connected conditions, after working a full career, VA actually is over compensating him, the study found. That's because that older veteran, with his working life behind him, would need only $10,223 to close an earnings gap with peers who nondisabled veterans. "So, while on average (VA compensation is) about right, there are age groups for which it over or under compensates," said Christensen. The imbalance occurs in part because the disability compensation system takes no notice of age or work experience when payments begin. The earnings gap is more pronounced for veterans who suffer mental disorders such as post-traumatic stress, CNA reports. A 25-year-old veteran rated 20 to 40 percent disabled from PTSD received on average VA disability compensation $4629 in 2005. Yet to match the earnings of nondisabled veterans of the same age, that PTSD veteran would need almost $11,500 a year in VA compensation for the rest of his or her life, the study found. By contrast, the 65-year-old veteran newly diagnosed with PTSD, also rated 20 to 40 percent disabling, faces a smaller earnings gap with peers --only $4,070. It's a gap fully closed by that VA compensation of $4,629. Related links can be found in the commission's June 7-8, 2007 public meeting minutes [pdf]. 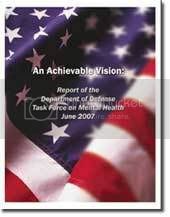 The Commission is seeking public comments [download pdf form] through July 10, 2007, to be considered for its next scheduled meeting on July 18-20 at the Washington Plaza Hotel in Washington, D.C. [download pdf details]. The Thursday media roundtable included an opening statement from Defense Secretary Robert M. Gates and Q&A concerning mental health issues facing our combat forces. All soldiers returning from Iraq or Afghanistan who seek any treatment at Veterans Affairs hospitals are now being screened for brain injuries and post-traumatic stress disorder, VA Secretary Jim Nicholson said Monday. The initiative, which has been in place about 90 days, was created in response to veterans' needs, he said. "Whether they come to us with a toothache or a sore knee, we screen them for any form of brain injury, and we are now screening every one of them for post-traumatic stress disorder," Nicholson told The Associated Press. Nicholson said that in the screening process, VA clinicians first talk to veterans, who will be given further testing such as brain scans if they have symptoms. He said previous research has focused on traumatic brain injuries rather than mild ones, which actually may account for many injuries in the bomb-ridden war zone. Nicholson said the additional screening is being funded through $100 million for enhancement mental health services and $20 million for veterans centers that help returning soldiers readjust to everyday life. Both were in the supplemental spending bill. This is very good, if long-in-coming, news. 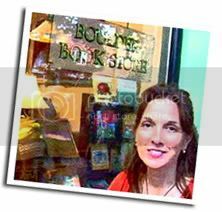 Returned from my Colorado book signings today (that's me in front of Boulder Book Store; many more photos coming as soon as I get them from a good friend who attended both, acting as event photographer). Great successes again, being able to reach out and talk with local military family members and nonprofit groups and concerned citizens. Will write more on each of my stops in the coming weeks -- my first nice chunk of free time. 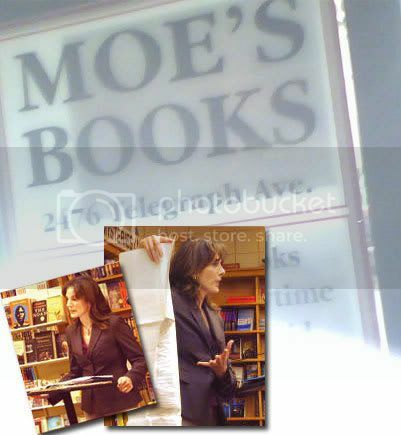 In the meantime, you're invited to read two audience accounts, one from my June 5 Berkeley stop at Moe's Books, and the other from Wednesday night's Boulder stop. As the daughter of a Marine who served in both Vietnam and the Persian Gulf and an attorney who works with people with disabilities (specializing - if you can call it that at this early stage of the game - in mental illness) I have both a personal and professional interest in soldiers with PTSD. Regardless of what you think about the validity of the war, I urge you to get informed about the issue and to do one small thing to help our returning veterans. (Many small efforts or big efforts are also appreciated.) You can support any number of bills currently in Congress or the Senate that offer an increase in the duration of guaranteed medical coverage veterans returning from Iraq or Afghanistan, that create new systems to prevent veteran suicides, or that give veterans easier access to the benefits system. To that end, I encourage you to check out Ilona Meagher's PTSD Combat Blog. This woman is my new blog hero. She is a former web developer who read an article about returning vets committing suicide and murder and launched her own investigation into the impact of PTSD on our troops and their families. She realized that most of the news coverage was from small town papers who wouldn't be able to keep the articles in their databases for long, so she started her own blog site. She has since written a fabulous book - Moving a Nation to Care - and created one of the best repositories of information regarding PTSD in current combat veterans. She did all of this simply because she cared about the issue. I am truly inspired. And I am truly humbled...and blushing. I doubt Ilona (or a number of the rest of us) expected to be doing what she's (we're) doing today just a few short years ago. And that is what is great about this community. "Ordinary" citizens are discovering that in fact they are extraordinary. When alarm increases, people are moved to get out of their comfort zone and do whatever they can to turn the tide around, aren't they? I'm honored to be a part of the extraordinary group of Americans that are doing our best to do just that. Thank you both so much for your coming out to see me on the road, for your gracious and insightful recaps, and for taking the time to help spread the word. This is exactly what the 'Moving a Nation to Care' project was intended to be in my brightest dreams. U.S. commanders in Iraq are rejecting a recommendation by Army mental health experts that troops receive a one-month break for every three months in a combat zone, despite unprecedented levels of continuous fighting and worsening risks of mental stress. Instead, commanders are trying to give troops two to three days inside heavily fortified bases after about eight days in the field, said Brig. Gen. Joseph Anderson, chief aide to the ground forces commander in Iraq, Lt. Gen. Raymond Odierno. "We would never get the job done of securing (of Baghdad) if we went out for three months and came back" for one, Anderson said. U.S. forces in Iraq spend more time in combat without a break than those who fought in Vietnam or World War II, according to Army psychologists who studied troops in Iraq. U.S. commanders can't match the World War II policy, Odierno said in a news conference late last month. Please read the rest, and then perhaps contact your elected officials and ask them if this is really the best we can do. Why bother studying these things, why bother fashioning one endless report after another if the military refuses to implement any of the recommendations they're ultimately given? Heading out to Colorado tomorrow morning as the Midwest leg of the Moving a Nation to Care tour continues. I've been having an incredible time meeting with people across the country so far, so I'm sure these dates will be no less satisfying. Touring can be exhausting, but exhilerating as well; the former being the reason for my being late in doing my event recaps (I may be a blogger, but I'm still not as good about it as many others are out there). After this next couple of events, things begin to wind down just a bit, and I'll have time to share some of the resource discoveries I've made with you. June 20, 2007 – 7:30 p.m.
June 21, 2007 – 7:30 p.m. In the restored Morey Mercantile Building, directly across Wynkoop Street from the new EPA building next to Union Station just blocks from Coors Field. Hourly parking lots are located near the store and streetside parking is also available. I'd also like to share an exclusive interview I gave to Colorado Confidential this week. Thank you to writer Wendy Norris for giving me a chance to talk about my work, and for helping to share news of my Colorado visit with her readership -- and you, too. My best to you and yours -- and hope to see you on the road! The Milwaukee County Zoo will host Operation Freedom, a tribute for Armed Forces personnel and their families at 11:30 a.m. Sunday, July 1. The event includes a picnic at 11:30 a.m. and a program at 2 p.m. All Army, Navy, Marines, Air Force, Coast Guard, Reserves and National Guard members and their immediate families may attend to enjoy activities. They may also explore the zoo from 9 a.m. to 6 p.m., according to a press release from the local Veterans Service office. Wristbands are required. Veterans who want to attend should collect their wristbands from [their local] Veterans Service Office. Information on parking and shuttle service is also available. Details and directions in the Operation Freedom flyer [pdf]. The wars in Iraq and Afghanistan have contributed to a sharp rise in the number of homeless military veterans, a recently completed Congressional Research Service report on homeless veterans says, and lawmakers are beginning to take notice. The report shows female veterans were as much as four times more likely to become homeless than non-veteran women, with male veterans nearly twice as likely to become homeless than non-veterans. Though many believe homelessness plagues Vietnam draftees disproportionately, the largest group of homeless vets comes from those who enlisted after Vietnam, the May 31 CRS report showed. And although experiences in combat and Posttraumatic Stress Disorder are contributing factors to homelessness, studies have "found no unique association between combat-related PTSD and homelessness," the report said. "Research has determined that homeless combat veterans were no more likely to be diagnosed with PTSD than combat veterans who were not homeless," CRS said. Since Vietnam, most veterans do not normally become homeless within the first 10 years of separation, the CRS report said. But a December 2006 "Iraq Veteran Project" study [pdf] prepared by the Swords to Plowshares veterans' advocacy group, troops who've served in Iraq and Afghanistan are becoming homeless sooner than their predecessors - seeking housing services within months after returning from Iraq. "New veterans are falling through the cracks, and they are shocked and angry at the lack of care afforded them," said Iraq Veteran Project report author, Amy Fairweather. "They stand at the precipice of chronic homelessness unless there is a concerted effort to address their needs." In April, Obama introduced legislation dubbed the "Homes for Heroes Act," which would establish grant and voucher programs to encourage development of affordable housing targeted for veterans. In addition, Sen. Daniel Akaka (D-Hawaii) has introduced a bill that would institute a program in which the VA and DoD would work together to identify returning members of the armed services who are at risk of homelessness. On the other side of the aisle, Sen. Larry Craig (R. Idaho), is lending his clout to the problem. "The number of homeless on any given night is too high and we are working hard on Capitol Hill to turn those numbers around," said Craig, who recently received the National Coalition for Homeless Veterans 2007 Congressional Award. In response to congressional pressure, the Pentagon recently partnered with several federal agencies to create an online portal called "Turbo TAP" designed to help veterans get the information, counseling, and access to the services they need to ensure a successful transition from military to civilian life. The CRS report adds there are currently five federal programs specifically designed to assist homeless veterans, these programs will require about $270 million in 2007, and future costs are on the rise. Other research indicates that VA homeless programs have already served as many as 600 returning OIF/OEF veterans and over 1,000 more have been identified as being at risk of becoming homeless, CRS added. 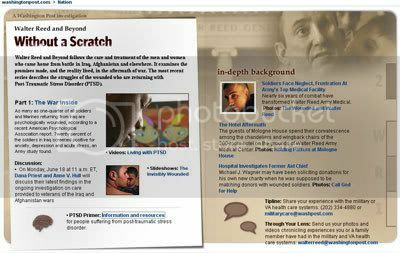 For Father's Day: Blue Star Mothers' "Guide to Post Traumatic Stress Disorder"
A wonderful resource to share with you on this day, Father's Day. For those of who have loved ones deployed or blessedly welcomed back curious to learn more about combat PTSD, I have a good resource for you: The Blue Star Mothers has just published a free 17-page guide to help answer some of your questions. After watching her own son return home from combat with post-traumatic stress disorder, an Army mom wants to share the lessons she learned -- and resources she found -- with others who find themselves faced with the same challenges. Emily Afuola said she'll never forget the emotions that tugged at her and her family when they learned that Pvt. Matthew Afuola had been diagnosed with PTSD during his deployment to Afghanistan with the 10th Mountain Division. "When families find out about this, they're scared and worried. They're in a state of shock and a state of panic," she said. Afuola sought out every resource she could find to get answers and allay her and her families' concerns. "Initially, it was very, very hard," she said. "But I found that people were out there who wanted to help." Afuola recognized that other families are confronting the same circumstances and wanted to share what she learned. 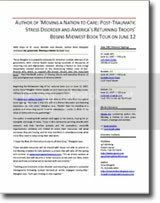 She joined together with several other members of Blue Star Mothers of America, Inc., to produce a 17-page "Guide to Post Traumatic Stress Disorder" to help them [link to guide in MS Word doc format]. "We knew that other families are going through the same thing we did, and we're hoping that through this, they won't have to walk the same path," she said. The guide offers basic, easy-to-understand information about what causes PTSD and symptoms to look for, as well as advice for getting treatment. It recognizes the effect a servicemember's PTSD has on family members, and the role they can play in helping their loved one deal with the affliction. One of the guide's most valuable resources is an extensive list of places to turn to for help. As the survivor starts showing signs of post traumatic stress, time is of the essence to receive proper treatment that will benefit them the most. The following is a condensed timeline that will help walk you through what to do and what will take place. 1. A loved one or yourself starts to recognize there maybe a problem. 2. If still in the military speak to a first sergeant, or someone above you in rank. You may also speak to a chaplain, as they will listen to what is happening or what you feel is happening. 3. If the symptoms last longer than a couple weeks start recording the symptoms so you will have a record. If it dissipates within the couple weeks it may be traumatic stress and not go any further, if it continues you maybe on a path that you will need treatment for PTSD. 6. Start treatment, this may include: education on PTSD, training for relaxation, coping suggestions, discussions, assessments, and counseling sessions. The treatment may start before, during, or following the evaluation. 7. Receive an evaluation: to receive an evaluation the symptoms must persist for one month or longer (reason for keeping a record as #3 suggests) and must interfere in their functioning capability. b. An assessment: this can be 8-1 hour sessions or more. It will include covering your history, your experience (stressors) that affected you, and your symptoms. The assessment is done in depth. Family members may be asked to provide additional information. c. A Global Assessment of Functioning Scale may be completed. This is a rating from the assessment and interview to be used as a diagnosis tool. Counseling: counseling sessions will be set up on an on going basis, as the professional so deems necessary. They may be held as an individual session, group session, or both. There are many other programs available for the survivor if they so desire or want more help and support. They may ask at the base hospital facility or the nearest VA/Vet Center. Phone numbers: it is extremely important to request phone numbers to have on hand for any emergency situation that might rise. These numbers should consist of at least one of the following: the counselor and or doctor, emergency treatment facility (hospital, clinic if there is one on base) including for the VA or you may request contact numbers for all of these facilities. You should have a copy of these to keep for yourself and for a loved one. Do Not wait until they are needed and you don’t have them, you may never need them, but don’t take that chance. Lots of helpful information and links, including one to PTSD Combat. Army Spec. Jeans Cruz helped capture Saddam Hussein. When he came home to the Bronx, important people called him a war hero and promised to help him start a new life. The mayor of New York, officials of his parents' home town in Puerto Rico, the borough president and other local dignitaries honored him with plaques and silk parade sashes. They handed him their business cards and urged him to phone. But a "black shadow" had followed Cruz home from Iraq, he confided to an Army counselor. He was hounded by recurring images of how war really was for him: not the triumphant scene of Hussein in handcuffs, but visions of dead Iraqi children. Even though a VA psychologist diagnosed Cruz with PTSD, and even though proof of his combat service was "well documented," his VA disability claim was turned down by evaluators. Once celebrated by his government, Cruz feels defeated by its bureaucracy. He no longer has the stamina to appeal the VA decision, or to make the Army correct the sloppy errors in his medical records or amend his personnel file so it actually lists his combat awards. "I'm pushing the mental limits as it is," Cruz said, standing outside the bullet-pocked steel door of the New York City housing project on Webster Avenue where he grew up and still lives with his family. "My experience so far is, you ask for something and they deny, deny, deny. After a while you just give up." Jeans Cruz and his contemporaries in the military were never supposed to suffer in the shadows the way veterans of the last long, controversial war did. One of the bitter legacies of Vietnam was the inadequate treatment of troops when they came back. Tens of thousands endured psychological disorders in silence, and too many ended up homeless, alcoholic, drug-addicted, imprisoned or dead before the government acknowledged their conditions and in 1980 officially recognized PTSD as a medical diagnosis. Yet nearly three decades later, the government still has not mastered the basics: how best to detect the disorder, the most effective ways to treat it, and the fairest means of compensating young men and women who served their country and returned unable to lead normal lives. They occupy every rank, uniform and corner of the country. People such as Army Lt. Sylvia Blackwood, who was admitted to a locked-down psychiatric ward in Washington after trying to hide her distress for a year and a half and Army Pfc. Joshua Calloway, who spent eight months at Walter Reed Army Medical Center and left barely changed from when he arrived from Iraq in handcuffs; and retired Marine Lance Cpl. Jim Roberts, who struggles to keep his sanity in suburban New York with the help of once-a-week therapy and a medicine cabinet full of prescription drugs; and the scores of Marines in California who were denied treatment for PTSD because the head psychiatrist on their base thought the diagnosis was overused. They represent the first wave in what experts say is a coming deluge. The Institute of Medicine reported last month that Veterans Affairs' methods for deciding compensation for PTSD and other emotional disorders had little basis in science and that the evaluation process varied greatly. And as they try to work their way through a confounding disability process, already-troubled vets enter a VA system that chronically loses records and sags with a backlog of 400,000 claims of all kinds. To qualify for compensation, troops and veterans are required to prove that they witnessed at least one traumatic event, such as the death of a fellow soldier or an attack from a roadside bomb, or IED. That standard has been used to deny thousands of claims. But many experts now say that debilitating stress can result from accumulated trauma as well as from one significant event. In an interview, even VA's chief of mental health questioned whether the single-event standard is a valid way to measure PTSD. "One of the things I puzzle about is, what if someone hasn't been exposed to an IED but lives in dread of exposure to one for a month?" said Ira R. Katz, a psychiatrist. "According to the formal definition, they don't qualify." For the past 2 1/2 years, the counseling center at the Marine Corps Air Ground Combat Center in Twentynine Palms, Calif., was a difficult place for Marines seeking help for post-traumatic stress. Navy Cmdr. Louis Valbracht, head of mental health at the center's outpatient hospital, often refused to accept counselors' views that some Marines who were drinking heavily or using drugs had PTSD, according to three counselors and another staff member who worked with him. "Valbracht didn't believe in it. He'd say there's no such thing as PTSD," said David Roman, who was a substance abuse counselor at Twentynine Palms until he quit six months ago. "We were all appalled," said Mary Jo Thornton, another counselor who left last year. A third counselor estimated that perhaps half of the 3,000 Marines he has counseled in the past five years showed symptoms of post-traumatic stress. "They would change the diagnosis right in front of you, put a line through it," said the counselor, who spoke on the condition of anonymity because he still works there. Please read the rest, which returns to the plight of Army Spec. Jeans Cruz. Good to see this issue being covered by these reporters. Then head over to Washington Post to view their multimedia presentation, "The Invisibly Wounded," where you'll get to know Cruz and others who gave their stories to WaPo reporters. You might also be interested in viewing the videos, "Living with PTSD:"
On Monday, June 18 at 11 a.m. ET, Post reporters Dana Priest and Anne V. Hull will discuss their latest findings in the ongoing examination of the treatment of men and women coming home from the war with physical and mental wounds. Visit the series' main page for more. And very nice to see a link back to PTSD Combat (under 'References') from the Washington Post's companion resources page. Overwhelmed by the number of soldiers returning from war with mental problems, the Army is planning to hire at least 25 percent more psychiatrists, psychologists and social workers. A contract finalized this week but not yet announced calls for spending $33 million to add about 200 mental health professionals to help soldiers with post-traumatic stress disorder and other mental health needs, officials told The Associated Press on Thursday. "As the war has gone on, PTSD and other psychological effects of war have increased," said Col. Elspeth Ritchie, psychiatry consultant to the Army surgeon general. "The number of (mental health workers) that was adequate for a peacetime military is not adequate for a nation that's been at war," she said in an interview. The new hiring, which she said could begin immediately, is part of a wider plan of action the Army has laid out to improve health care to wounded or ill veterans and their families. It also comes as the Defense Department completes a wider mental health study - the latest in a series over recent months that has found services for troops have been inadequate. Ritchie said long and repeat deployments caused by extended wars in Iraq and Afghanistan are causing more mental strain on troops. "At the time that the war began, I don't think anybody anticipated how long it would be going on," she said. The Senate Armed Services Committee on Thursday unanimously approved legislation that would improve medical care for service members returning from active duty in Iraq and Afghanistan, CongressDaily reports (Gambrell, CongressDaily, 6/15). The bill would eliminate inconsistencies in the disability compensation system and calls for a review of cases in which service members received low disability ratings to determine whether they were given adequate benefits. The measure would increase military severance pay and provide $50 million to improve diagnosis, treatment and rehabilitation of veterans with traumatic brain injury or post-traumatic stress disorder. The legislation also would provide more counseling for families of service members wounded in combat. In addition, the bill would require the Department of Veterans Affairs secretary and the Department of Defense secretary to develop a comprehensive care plan for veterans by Jan. 1, 2008. The two departments also would be required to establish an interagency office to develop a joint system for electronic health records. Committee Chair Carl Levin (D-Mich.) said, "This is record-breaking time we've been able to put together such a comprehensive bill and a much-needed addition to the treatment and care of wounded warriors and veterans" (AP/Arizona Daily Star, 6/15). Richard Daley, associate legislative director of Paralyzed Veterans of America, said the measure, along with similar veterans' legislation passed this year, has greatly improved veterans' care. He said, "This could be one of the best years for veterans in decades" (Whitney, McClatchy/Lexington Herald-Leader, 6/15). The measure now moves to the Senate floor (AP/Arizona Daily Star, 6/15). Blushing as I read the rest. Thank you, Susan and my friends at Daily Kos, for making this project richer and much more meaningful. I've been telling folks I meet on my book tour that many hands have dipped into the mix as I worked on Moving a Nation to Care. We can accomplish a lot when we work together; this is certainly one example of that. Meagher’s slim but powerful volume brings together the many strands of information about PTSD she has tirelessly pursued for the past several years in a comprehensive and readable fashion. As a resource for anyone concerned with veterans or mental health issues in general, Moving a Nation to Care is unequalled in its simplicity and scope. Please read it in full (additional reviews here). I'm sorry a bit late in passing this on. Please catch a rerun of last night's excellent Henry Rollins Show with guest Paul Rieckhoff, founder of Iraq and Afghanistan Veterans of America and a tireless vets' advocate (times below). And get ready for another member of IAVA hanging out Monday night with Jon Stewart on the Daily Show. You've seen IAVA on CNN, MSNBC and Fox - this one should be on the lighter side. Our Director of Government Affairs, Todd Bowers, will be on the Daily Show on Comedy Central Monday night at 11pm ET / 10pm CT. Todd served two tours in Iraq as a civil affairs sergeant with the Marine Corps, and he's going to be featured in a 'segment' on counterinsurgency. If you can't watch it then, it will be running again on Tuesday at 1am, 10am, 2pm and 8pm, ET. And Friday, I'll be on the Henry Rollins Show at 11pm ET / 8pm PT on the IFC channel. We'll be discussing the situation in Iraq, and some of the problems faced by our troops. The show is definitely one of the edgiest on TV. Henry tells it like it is, and talks about issues that matter. I'll be appearing with fellow Iraq Vet Jason LeMieux and musical performer Bob Mould, the front man of Husker Du and Sugar. You can watch the promo video here. If you can't catch that the first time, it will replay this Saturday 4:25am, Monday at 9am, and Tuesday at 12:30am. Good to have more vet voices on the airwaves. Have some audio programs to share with you. Thank you to the producers, especially Mary, host Don and crew of "St. Louis on the Air," a call-in program on local NPR affiliate KWMU 90.7 FM. They invited me on for a full hour this past Tuesday, and I think you'll agree that the discussion was informative and lively. The callers were exceptional. 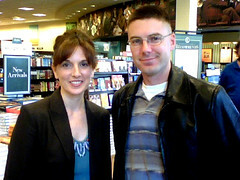 A discussion with Ilona Meagher about her book detailing the incidence of post-traumatic stress disorder among American Veterans. Check out my latest media appearance audio and video links, as well as a taping of a full "Moving a Nation to Care" reading -- recorded at Moe's Books on June 5, 2007 [ part 1 :: part 2 ]. Back from San Diego after a hopeful week on the road. This time I visited the great Southwest and points along the West Coast on the second leg of my Moving a Nation to Care tour (first New England leg). Great to see communities across the country working together creatively to support their -- and our -- returning troops and military families on the homefront. Every stop has its own unique flavor and flow. I've enjoyed being in these lovely bookstore spaces and chatting with those attending and those behind the scenes, too, especially the wonderful events coordinators. Thank you to Owen, Janet and Andrea at Moe's, Changing Hands, and Barnes & Noble respectively for making my visits all the more special for me. 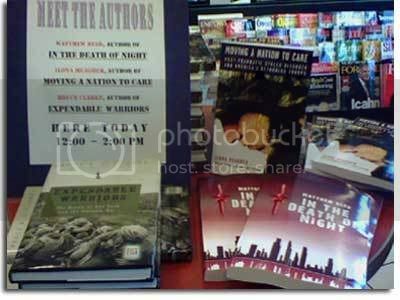 Thanks as well to fellow first-time author Matt Reed ("In the Death of Night"), a Marine who was my 'featured authors' partner yesterday at the Camp Pendleton-area B&N. The press has been great, too. Big thanks to reporter Carey Peña of KTVK-TV Channel 3 and Air America-Phoenix' Jeff Farias for inviting me to talk about my book with their listeners (and a ^5 to Mark Fleming for shuttling me back and forth in time to make both of them). My understanding is that Peña is working on a special two-part series on combat PTSD, and my taped interview will appear alongside local veterans and others involved in the issue. It's slated to air in a couple of weeks. Incredible people coming out to share their knowledge and needs and time and resources with everyone assembled. Then they charge me up for the next stop on my journey. San Francisco on Monday, Berkeley and Oakland on Tuesday. Wednesday it was Phoenix, Tempe, and then Tuscon followed on Thursday. On Friday morning, I rented a car and drove across the desert (through the Imperial Dunes with my mouth and eyes agape) and made my way to Oceanside, near Camp Pendleton, for a beachfront reception. Saturday, once more in Oceanside at my final book event before flying out of San Diego and calling it a successful week. Ilona Meagher talks and writes about PTSD and frequently opens book events by listing a few of the 80 or so names for the disorder in the popular lexicon. These include Old Sergeant Syndrome, Railway Spine, Buck Fever, Swiss Disease, War Syndrome and that oldie but goodie – Shell Shock. * Each generation has to rediscover the horrors of PTSD. * Each generation does not want to have to deal with it. Part of this is because there is genuine disagreement among doctors about what exactly PTSD is.This makes it even more of a political football at a time when the U.S. is deeply entrenched in an increasingly unpopular war being run by a president who has been notably insensitive the suffering of the men and women he has sent into combat. Part of this also is that "cowardice" is never far away in discussing PTSD. The notion that "you have to be a man" and not admit to pain or emotional distress runs deep in the military psyche. While I did not expect my sergeant to kiss my boo-boo or read me a bedtime story, my one (non-combat) injury while serving in the Army was treated with disdain and ridicule. "The reality is that combat PTSD – or whatever we once called it, or whatever we’re going to call it next – calls into question the human reliance on war to solve our problems. "While we may wish that our smart bombs and our superior military power will so overwhelm our enemies that our wars can be clean, quick and painless – and without any blowback on us or those we’ve sent to fight in them – there’s no debating that war trauma has always existed, and it will exist as long as we wage war. In many aspects, the war trauma of today can be more debilitating that that of previous eras . . . but a lingering shock to the system following combat has been a common thread that ties each generation to the next." A few tour shots are up on Flickr now (more to come). June 12, 2007 – 7:00 p.m.
Download the Midwest tour press release [pdf] for more details, and pass it on. About Face program appearance on 1480 KPHX - Phoenix AAR. Listen and call in at 800-989-1480. Friday night, 6 - 9 p.m.
Saturday afternoon, 12 - 3 p.m.
You are all invited to join me in welcoming Ilona Meagher, author of "MOVING A NATION TO CARE" (see attachments please). A PEACE VIGIL on June 8th from 6 p.m. - 9 p.m. on the beach next to OCEANSIDE PIER. We will be designing a large PEACE sign with luminares again! 7 p.m. - 8 p.m. - Reception to welcome ILONA MEAGHER. 8 p.m. - 8:30 p.m. - Lighting of the luminares, time to reflect on the sacrifices of our military members and their families, music and 5 minutes of silence. NOTE: Ilona hopes to have books with her at the VIGIL that she will sign for any Iraq/Afganistan veteran that attends...there will be a LIMITED quantity. SECOND NOTE: PLEASE pass this invitation FAR AND WIDE. Ilona would love to meet as many VETERANS as she can...this book is for them!!! And, as if that weren't enough. Are you ready for more? Hope to see some of you. And please share the details.